Learn to analyze, not memorize, with step-by-step, self-paced ECG courses led by Vernon R. Stanley, MD, PhD, an experienced emergency medicine physician. Courses run the gamut from basic to advanced and cover a wide range of topics including the normal pattern, STEMI, nonSTEMI, Bundle Branch Blocks, LAFB, LVH, and WPW. Ultimately, you will learn how to analyze changes associated with the changes of the acute MI/ischemia. Designed to be taken at your convenience as a home-study/self-study course, you can stop and start on your schedule, and an online bookmark can bring you back to where you left off. Choose from 3 individual courses or a bundle of all three. Select courses include written materials such as textbooks, workbooks, and a HEART© Rule. Shipping: All physical products will be shipped in 4 to 6 business days of registering on the Online ECG Course website, where you will input your shipping information. Instructions on how to access your course will be emailed to you following purchase. 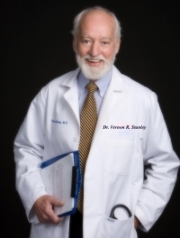 Vernon R. Stanley, MD, PhD, is a practicing Emergency Physician and Regional Medical Director for a physician management group. His experience includes over 30 years of emergency medicine experience - 20 years at the Charleston Area Medical Center, Charleston, WV, one of the largest cardiac centers in the country and a Level I Trauma Center. Save when you purchase this 3-course bundle of the 12-Lead ECG Course, Animated Rhythms Course, and the 50 Online ECG Case Studies course. Receive a comprehensive ECG review, cover all 26 rhythm patterns, and cover 50 12-Lead ECG tracings with clinical discussions and quizzes. Learn more and view all courses included in this package. Learn to analyize, not memorize, with The 12-Lead ECG Course. A hybrid of online material and written material, this course is made for flexible home/self-study. Review the normal pattern, STEMI, nonSTEMI, Bundle Branch Blocks, LAFB, LVH, and WPW and ultimately learn how to analyze changes associated with acute MI/ischemia. Learn more and view a course outline. Choose the 50 Case Studies Course for an excellent review of 12-lead ECG and Rhythm interpretation. Cover 50 12-Lead ECG tracings with clinical discussions and quizzes. Topics include: STEMI, non-STEMI, Bundle Branch Blocks, WPW, LVH, WPW as well as common rhythm abnormalities. Learn more and view a course outline. Cover all of the common ECG rhythms you will encounter in your practice. All 26 rhythm patterns are presented with animation to correlate the electrical path through the heart to the tracing on the rhythm strip. Ideal for preparation for Advanced Cardiovascular Life Support (ACLS) certification, board review, or recertification. Learn more and view a course outline.